On April 30, 1900, a railroad engineer named Casey Jones was driving his passenger train, The Cannonball Express, on a midnight run from Memphis, Tennessee to Canton, Mississippi. Jones started his trip behind schedule. He tried to make up for lost time by running the Cannonball as fast as he could. At 3:52 am, Jones and the Cannonball crashed into another train whose cars were blocking the main line. After smashing through several of the obstructing cars, the Cannonball Express jumped the tracks. Casey Jones was killed in the wreck, but amazingly no passengers were killed. Jones was regarded as a hero because he refused to abandon the train, and did everything possible to slow his speed just before the collision. He died with one hand still gripping the brake handle, and the other hand on the train’s whistle. Casey Jones was breaking speed records on his last run to make up for his late start. Similarly, Yellen is making up for lost time by projecting 300 basis points of rate increases over the next three years. This implies rate hikes of 100 basis points per year or 25 basis points every other FOMC meeting. Based on this schedule, the next rate hike is set for March 16. That’s just two weeks from today. But there’s trouble ahead. Something is blocking the Fed’s path, just as there was another train blocking the path of the Cannonball Express. That something is the market. Specifically, the fed funds futures market. The market does not expect a rate hike in March. In fact, the market is giving low odds of any rate hikes in all of 2016. Meanwhile, the Fed is moving at full throttle toward a rate hike. There are only three possible outcomes. The first is that the market gets safely out of the way by adjusting expectations in the next two weeks. The second is that Yellen grabs the brake and slows down the Cannonball Express by signaling that the Fed will not raise rates. The third possible outcome is a train wreck that will roil markets. Global markets have been in turmoil since the Fed’s last rate hike in December. This is because the Fed tightened into what was already a weak economy. If the Fed continues tightening, a U.S. recession later this year is highly likely. The Fed had its own reasons for tightening. They wanted to avoid making asset bubbles any bigger. (Bubbles in stock and real estate markets had been inflating for years under the Fed’s zero interest rate policy.) The Fed needed to maintain its institutional credibility after promising for over a year that they would begin to raise rates in 2015. And, just as Casey Jones did not see danger until it was too late, Yellen does not see a recession. Her forecasts, using badly flawed models such as the Phillips Curve, NAIRU, and FRB/US, are signaling steady growth, tighter labor markets, and inflation just around the corner. The Fed has not entirely ignored recent market turmoil. The Federal Open Market Committee (FOMC) made reference to it in their January statement. And several Fed officials have echoed those concerns in public pronouncements and speeches since then. The problem is that the markets have overinterpreted these supposedly dovish statements. What Fed statements actually say is that they are watching the turmoil closely. At no time has the Fed said they would deviate from their prior course. It would be easy enough to do so if that’s what the Fed wanted. Saying you are watching something is not the same as saying you are changing what you already planned to do. The plain implication of recent Fed statements is that financial conditions will have to get worse than we have already seen to cause the Fed not to raise rates in March. The market’s dovish interpretation of Fed statements is wishful thinking. In fact, the market’s dovish view has made it more, not less likely the Fed will raise rates in March. The dovish interpretation caused equity markets to rally the past two weeks in expectation of no rate hike. The rally eases financial conditions, which makes it easier for the Fed to raise rates. 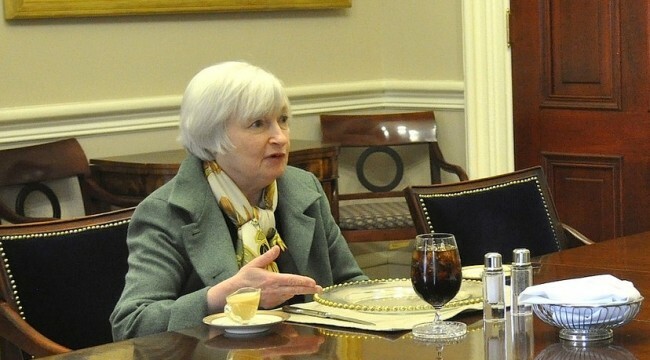 What would it take in the next two weeks for the Fed not to raise rates? There are three scenarios. A plunge in the S&P Index to 1650 (a 15% decline from current levels) would stop the Fed in its tracks. If the February jobs report (due this Friday, March 4) produces fewer than 100,000 jobs or if unemployment rises to 5.0% or higher, that would give the Fed pause. Right now none of those scenarios seems likely to emerge. The Cannonball Express is still running at top speed. If the Fed hikes rates in March when the market is not expecting it, the rapid repricing of rate hike expectations will lead to a stock market mini-crash. Will a Fed rate hike in March lead to a train wreck by crashing into market expectations? It depends on whether Janet Yellen can signal the markets that her Cannonball Express is not stopping. Casey Jones died frantically pulling the train’s whistle. Janet Yellen needs to start blowing the Fed’s whistle and warning markets now — before it’s too late.